In today's global marketplace, you must appeal to customers from the whole world. To compete successfully in the world economy, your web site must be available in multiple languages. Over two-thirds of internet surfers search in languages other than English. If you neglect this massive online population, you are missing out on a huge market..
Site Translator is designed for web site owners and web developers who need a simple, do-it-yourself solution to web site language translation. With a few mouse clicks, you can translate virtually any site designed in HTML, ASP.NET, PHP, PHP3, or PHTML into multiple languages. It intelligently identifies and translates phrases and sentences within your web page source code. All the text content for your Website will be translated including hyperlinks pages and picture titles. 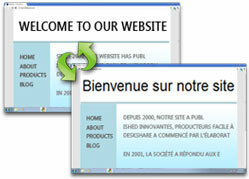 The original Web site layout is preserved in translated pages. It translates only the content of your web pages and leaves the source code unchanged. Creating and maintaining a multilingual web site link structure can be difficult for developers. Site Translator solves this problem by managing all internal page links during translation. Links to outside web sites are not changed. 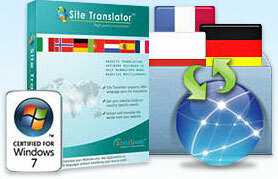 Site Translator uses automated machine translation technology. This allows it to translate entire Web sites in minutes. The translated phrases are stored in the Translation Memory, which you can easily modify to improve accuracy. You can also use Site Translator to localize your .NET programs. It doesn't matter what language you write software in. Whether you use VB.NET, C# or any other .NET language, you can translate all the labels, menus and other text in any .NET program by translating the .RESX files. You can use Site Translator to translate the text stored in any XML file. Language is no longer a barrier! When you purchase Site Translator, we include a one year subscription to the World Language Pack.